If you're in your late teens, twenties or are a little older, the odds are you've heard Ginuwine. His hugely successful "Pony" back in 1996 was only the beginning of his success and through today, he has proven himself as one of R&B's most recognizable artists. Ginuwine is set to release his fifth album, "Back II Da Basics" on November 15th. MVRemix: What's your first memory of R&B? Ginuwine: First memory of R&B? That'd probably be with New Edition - "Candy Girl," when the "Candy Girl" song came out. [chuckles] Aside from that Michael Jackson. MVRemix: Was singing something that came naturally to you or were you taught? Ginuwine: Well I never really knew I could sing, I used to be in a pop-break dancing group and we had kind of felt poppin' and break dancin' was goin' out of style so we didn't want to break up the group, so we turned into a singing group because some of us could sing and some of us couldn't. But we was like "Alright, lets use those of who can sing and..." Michael Jackson was out at that time, so I was like "Let's just do something like a Jackson 5." It didn't come to me that easy though, I always felt that I could do it but I wasn't that interested. MVRemix: How does the Ginuwine of 2005 compare to that of 1995? Ginuwine: I think you can see the growth and see I've matured a whole bunch in my actions, in my words on my songs - just me taking control of my business. You understand gettin' into the business this long being function-able is a blessing because I've definitely been through a lot. I'm just more focused, back then I was just all about fun. I'm more focused now and you can hear it in my music. MVRemix: Kind of continuing from the troubled times you've been through, how did you cope with the tragic passing of your father? Ginuwine: What pulled myself through those times was my music and me being able to express how I felt inside and put it down on paper. Being able to read it and being like, "Wow, it's really comin' out." I think a lot of people have different ways of healing themselves from certain situations and tragedies in their life. That was just mine, my ability to write it down and sing about it. Ginuwine: [laughs] You know what, I knew I would get asked about that a lot and what's funny is you hit it on the head, that's what it was supposed to be in the beginning and that's why I named it that. But, our schedules conflicted and we wasn't really able to get together, get in the studio and make that magic again like we once did but I still needed a sign for myself to tell me what to do in order to be successful. "Back II The Basics" was something that I could not only use as us as a team; me and Timbaland going back in the studio, but I could use as a reminder of what I need to do to be successful in this business and that's what I did. I just kept the name and more so now, it's more of a sign to myself reminding me to go back to the basics and don't worry about what nobody else says and do what you do. MVRemix: What's the relationship like between the two of you right now? Ginuwine: Me and Timbaland�s relationship is fine. Like I said our schedules conflict a lot and he has a lot that he's doing. I have a time period that I have to stay within and if I can't have stuff out by that time, I get faulted for that or I get beat over the head for that. So I have to stick to my schedule and if we can't work together I can't hold off because he's not available or ready. I have to go out here and do what I do. I haven't really worked with Tim[baland] since the second album. I think that was good for me also in my times of thinking, having people think that I couldn't do it without him, I think it was good that I did step away and do it on my own. As a matter of fact, my biggest song is with someone else. It wasn't with Tim, so that really made people see that I could do it on my own too, that made me stand apart from me needing a Timbaland or me needing anybody. I showed people that I could do it on my own. I wrote the song and I just felt that that was needed also. We're supposed to be going back in in March, so we can definitely start from the beginning and finish. MVRemix: Tell me about the album... Which song had the most meaning for you? Ginuwine: I like a lot of songs for different reasons. My strength has been slow songs, ballads... So I would have to say a song on there called "Better Half" and there's a fast song called "Girl." "Better Half" is a song about if you're married or if you have a boyfriend or a girlfriend or whatever, that's your better half. That's who balances you, that's who makes you a better person. I like to look at it as a part two to "Differences." "Girl" is just a song that I know I could perform like crazy on stage. It's just one of those songs that I know I can get down to, so they're my two favourites. MVRemix: Do you have any guest appearances? Ginuwine: I got a guest appearance from Jadakiss and that's about it. When I do my albums I don't like to do compilations, I like to do Ginuwine so when you buy the Ginuwine album that's what you get. With this one I asked Jadakiss to get on there and he did, we did a song called "Club" and that's pretty much it. MVRemix: If you had to compare the album to a particular luxury car or designer clothing label, which would it be and why? MVRemix: What are your thoughts on the current world of R&B? Ginuwine: I think we're building it back up. I think the current state of R&B is hurtin', but I think us as artists out here, I think we're building it back up. I think rap has really taken over. It has been a long time comin' for the rappers and everything. They definitely deserve it and everything, but you can't put on rap when you makin' love. You can't put on rap when you're doing a lot of things, so I think there's room for both. I think rap has overwhelmed us a lot but now it's constantly coming back up. With the Usher's, with the Omarion's, with the Mariah Carey's and Alicia Keys', I think we're bringing it back up and where it needs to be. MVRemix: Do you feel your image has changed over the years? Ginuwine: Well yeah, I think with maturity, with growth, with you gettin' older and experiencing different situations and everything in life, I think you change period. You don't wanna stay the same all the time. You wanna cut your hair, sometimes you wanna get corn-rows, you wanna get pony-tails, you wanna do whatever! I think that's what is. Image is a big part of it but I do think I've changed a lot since when I first came out. I do think it's very important for us to change our image because you don't want to keep lookin' the same, you don't wanna keep lookin' the same person. You wanna change somewhat, whether it be clothes, your attitude, whatever. With growth everything changes anyway so I'm happy with the change I've made. MVRemix: What do you think has made you the success you are? Ginuwine: Just being truthful to my music and truthful to myself. Just gettin' in there and workin' real hard and connectin' with people. That's the main thing that a lot of writers and stuff should do - it's try to go in there and create scenarios that other people can connect with. I think that's what all music is, just a connection. MVRemix: You spoke briefly on Michael Jackson being one of your influences - what are your thoughts on the verdict reached earlier this year? Ginuwine: I thought the conclusion of the trial was just what it was. I felt like if he was found guilty, he was gonna be guilty. If he was found innocent, that's what he was. In a position like he is, you can never tell because I believe that he loves kids. I believe that he does everything for kids. But when you hear all this stuff, you do second guess. I just feel like this particular one was tryin' to get his money. He was found innocent, I mean he wasn't found guilty on no counts. We're talkin' thirteen counts, when you're guilty you're gonna be found guilty on somethin'. He wasn't found guilty on nothin', so evidently there was stuff in that trial that we didn't hear and they were able to come to the conclusion of "Not guilty." I'm glad he wasn't. MVRemix: Do you have anything else lined up in terms of film or TV? Ginuwine: Right now I'm lookin' forward to openings in movies or television, but right now I'm just taking care of the music and whatever doors open for me to walk in and create a situation where I can be in a movie or whatever, I'm gonna step in and do what I have to do to do that. But right now it's all about the music. Ginuwine: [laughs emphatically] That's hard to say man because I don't really not get along with nobody. I would fight whoever wanna fight me. I can't really name somebody like that because I get along with everybody and I'm a very people type person. There's not really nobody that jumps out at me when you say that so I'm not gonna try and dig for it. 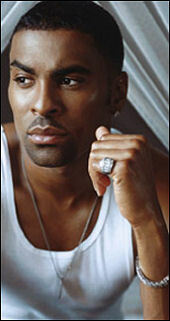 Ginuwine: Probably that I'm conceited because I get that all the time and I've got that all my life. It really ain't no shock that people think that but it's funny because people think that just off the top without knowing you or talking to you. Ginuwine: Thank you for all the support, hopefully when the new album comes out November 15th you'll go and support. The new single is called "When We Make Love" so check for that and vote for that on BET. "I think you can see the growth and see I've matured a whole bunch in my actions, in my words on my songs - just me taking control of my business."